The Chicago Cubs aren’t the only MLB team with a long World Series drought. The Cleveland Indians, who captured the American League pennant, haven’t won a World Series since 1948. Although the Tribe’s streak pales in comparison to the Cubbies, who haven’t won since 1908, it’s still the second longest championship drought in baseball history. Baseball fans across America are praying for a Cleveland-Chicago World Series, since once of those two franchises will finally get off the schneid. When the Indians last won in 1948, Harry S. Truman was POTUS, Gentleman’s Agreement starring Gregory Peck won the Oscar for Best Picture, and pacifist leader Mahatma Gandhi was assassinated. That year Cleveland defeated the Red Sox in a one-game playoff at Fenway Park to determine to AL pennant winner. The Indians then went on to beat the Boston Braves in six games in the first World Series to be televised nationwide. Outfielder Larry Doby hit .318 to pace the Tribe, while Bob Lemon won both of his starts, including the Game 6 clincher. The Indians won AL pennants in 1954, 1995 and 1997, but lost the World Series both times. You have to go back 108 years to find the last time the Cubs won a World Series. In 1908, when Chicago beat the Detroit Tigers in five games for its second straight title. 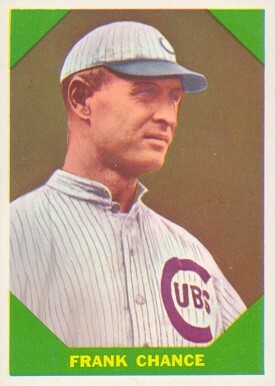 The Peerless Leader, Frank Chance, managed the Cubs that season and also led all batters with a .421 average. Mordecai “Three Finger” Brown and Orval Overall each won a pair of games. The Cubs last visit to the World Series came in 1945, 71 years ago, when they lost to the Tigers in seven games. Chicago also advanced to the Fall Classic in 1910, 1918, 1929, 1932, 1935, and 1938, only to lose each time. The Los Angeles Dodgers, currently battling the Cubs in the NLCS, also have a long championship drought. LA last appeared in the World Series in 1988, when they beat the Oakland A’s in five games. In their first three decades in Los Angeles, the transplanted Brooklynites went to the World Series nine times, winning five. But it’s been 28 years since the Dodgers’ last title. In my latest copy of the world’s largest circulation manage, aka AARP Magazine, they had a Power of 50 page devoted to baseball’s 50 funniest notable quotables. Well, here’s my favorite 10 — along with another Yogi-ism for the wrap. Enjoy. And send me your favorites.